I woke up at 4:00 this morning and, of course, reached for my phone. When I went to Facebook I found out that David Bowie passed away yesterday. I am both shocked and saddened by his death. David Bowie was such an iconic singer and songwriter. His style was so unique and ever changing, and his voice! I loved the distinct sound. 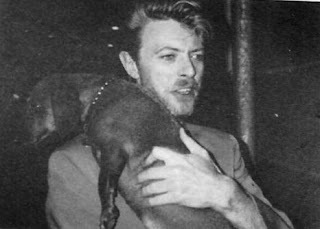 And - he even loved dachshunds. I grew up hearing Bowie music on the radio, but especially found I loved his music in the 1980's when the album Let's Dance was released. (Earlier blog post about "Let's Dance" here.) It is easily one of my top 10 all time albums. Over the years I have gone back to his early music as well, and found songs I really love, like "Young Americans," "Heroes," and "Life on Mars." And then there is "Absolute Beginners." I love this song. I love it so much I have to stop what I am doing and just listen to it anytime I hear it on the radio. 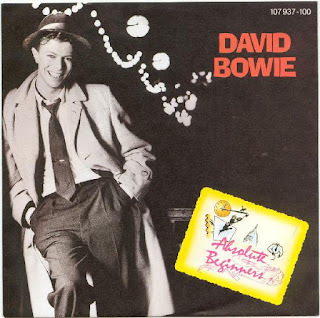 It was also the title song of the 1986 movie Absolute Beginners, set in 1950's London as jazz transitioned to rock, and young people started to rebel. This unusual musical movie is pretty amazing ... and if you haven't seen it, one I recommend. David Bowie's performance in the movie is a standout. The "Absolute Beginners" music video is so striking. It starts out like a film noir, with David Bowie walking down a late night street. The video, directed by Julien Temple, was inspired by the Strand cigarette tagline: "You're never alone with a Strand." Do you remember this song? And what are your favorite David Bowie songs? I'd love to hear from you in the comments, below. I haven't felt this unsettled by a musician's passing since Joe Strummer left us in 2002. Loved Bowie in all his creative incarnations, and he fully lived and embodied each one. I have an extra soft spot for what was arguably his least well regarded period, Tin Machine. I was Italy when their first album came out and it just resonated with me in what was then a very difficult period of my life. He will be missed. Shocked by the news of his passing, he was a legend in his own right. There was absolutely no one else like David aka Ziggy Stardust! I really wasn't a big fan but I did like a bunch f his songs. "Rebel, Rebel" I think is my favorite. However, he is no longer suffering and that is good, as he struggled with cancer. To David Bowie who was such a unique musician. I was so surprised to hear that he had passed. He was definitely a legend, it wasn't even a week ago I showed my husband the Labyrinth. Definitely going to miss his music, and thankful he was able to finish his latest album before his passing. Loved Labyrinth and have been mourning his passing this morning by listening to the soundtrack. Such talent! Thank you for intruding me to David Bowie! Sorry to hear that someone you like so dearly passed away. Going hit play on that youtube link you posted. I had a similar experience of reaching for my phone int he middle of the night and seeing the news. I thought it couldn't be true, he JUST released Blackstar? I've spent all day re-listening to his albums and being grateful that he left us this wonderful body of art work. Thanks, all, for stopping by! Kati, yes, I think Blackstar was just released last week. Marci and Cori, I have never seen Labyrinth. Yikes! I need to find it and watch.